Contemporary styled custom home designed by Harry Schrader, situated on a private waterfront lot with spectacular views of open water and sensational sunsets!. Great location in The Peninsula area with a private lot on one of the most prestigious streets. Well appointed open living areas that blend formal & informal spaces for best in casual lake living. Gourmet Chefs Kitchen with honed granite & mosaic tile backsplash & butcher block island. Elegant dining room that features glassed in wine room. Main floor features study, stone fireplace, built-in bar. Fun times await in lower level with tv/media room & exercise area with travertine tile throughout. Separate Guest House with kitchen, bedroom & bath. Exceptional Owners Suite with vaulted ceilings & oversized windows. Walk out to perfect outdoor retreat with built-in stone hot tub, firepit, covered patio & private dock w/ slip. 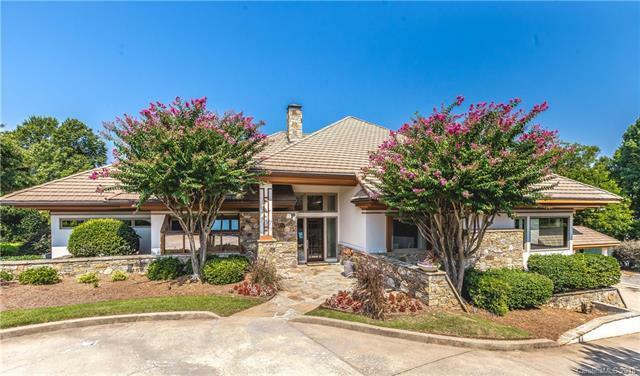 Enjoy lake living at its finest in this must see home packed with custom features and breathtaking views.